Uttley J, Fotios S. The effect of ambient light condition on road traffic collisions involving pedestrians on pedestrian crossings. Accident Analysis & Prevention, 108, 189-200. Active travel (walking and cycling) has a range of benefits and can support key national and international policies related to physical health, climate change and air quality. The UK Government thus introduced a statutory strategy to increase rates of walking and cycling, the Cycling and Walking Investment Strategy (CWIS). The CWIS targets include the aim to double cycling by 2025 (c/w 2013). There are infrastructure targets for 2040 which include better planning for walking and cycling so that “cycling and walking (are) the natural choice for shorter journeys”. The CWIS recognises that cycling cuts congestion (it saves 1/3 of road spaces compared to driving), cuts pollution (shifting just 10% of journeys from car to bike would reduce air pollution and save 400 productive life years) and that regular cycling counters a wide range of health problems such as stress, strokes, diabetes, some cancers and absenteeism from work. Cyclists and pedestrians are vulnerable road users. In 2015 they represented 14% (cyclists) and 38% (pedestrians) of all road casualties per passenger on GB roads, exceeded only by motorcyclists (44%) with other motor vehicles combined accounting for 4%. Perceived risk is also a significant factor that dissuades people from walking and cycling. UK and international policy therefore aims to not only increase rates of active travel, but also make it safer, hence why protecting vulnerable road users was one of the key priorities of the 2015 British Road Safety Statement. Figure 1. Effect of darkness compared with daylight (odds ratio) on active traveller counts in Arlington, US. Odds ratios calculated using two methods – clock change method compared counts before and after daylight saving time clock changes. Whole year method compared counts in same hour when in daylight or darkness, across whole year. Error bars show 95% confidence interval. Daily life in modern society is becoming an increasingly 24-hour activity, and walking and cycling should therefore be a safe and attracive travel option at all times of the day, including when it is dark. However, we have demonstrated that ambient light influences rates of active travel, analysing the numbers of people walking and cycling as recorded by automated counters in one US city. The novelty of this work was to isolate the effect of ambient light from other variables by comparing the numbers of people walking or cycling at a specific time of day but when this period was in either daylight or dark, extending a method previously used to investigate lighting and road traffic collisions. 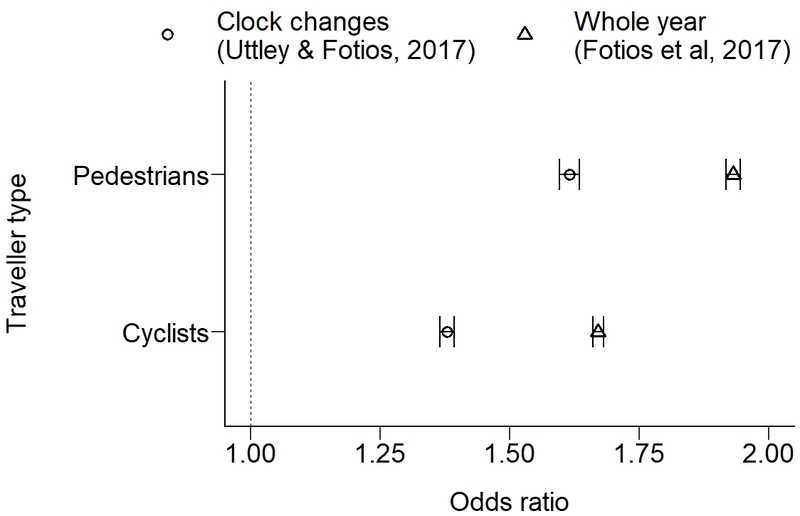 These analyses revealed significantly greater tendency to walk or cycle in daytime than after dark (Figure 1), and, after dark, a significantly greater tendency to walk or cycle on lit roads than unlit roads. We used similar methods to also show the increased risk to pedestrians of involvement in a collision after-dark, specifically at pedestrian crossings. Figure 2. In previous work we have shown the increased risk to pedestrians when using pedestrian crossings after-dark, compared with during daylight. As part of further work in this area we aim to validate these findings about light, lighting and active travel using alternative sources of data such as crowdsourced records of trips (e.g. Strava). We also plan to examine how active travel is influenced by lighting characteristics such as lamp frequency, lamp type and amount of light, and we are currently validating potential sources of lighting data to use for this work. Our overall goal with this research is to ensure lighting plays an important role in encouraging safe active travel, and is considered in future infrastructure plans for example through integration with existing planning tools.